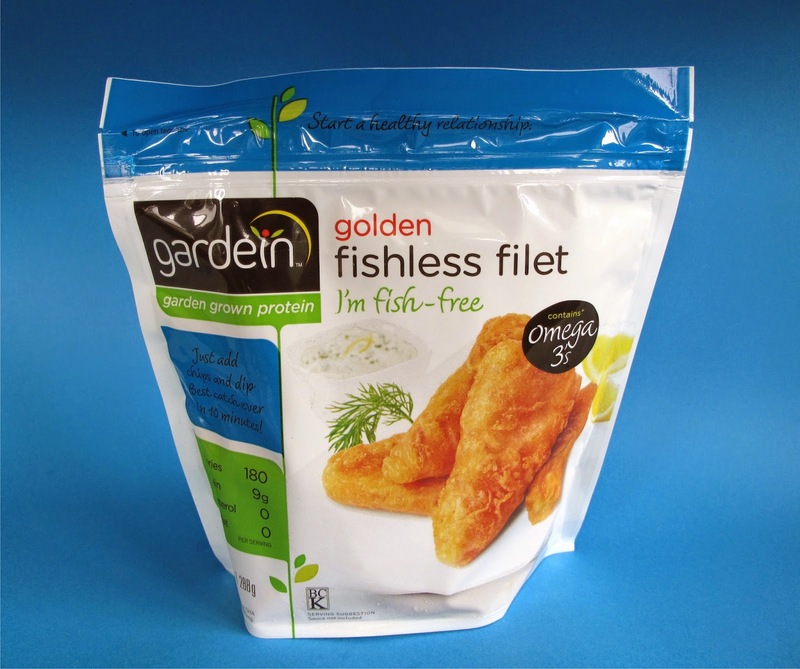 The first time I had a Gardein Golden Fishless Filet was at Expo West in Anaheim over the Spring. It was my favorite product of the show, and I've been eagerly waiting its arrival in Omaha. Well it's finally here! I found it at my local Natural Grocers of all places. I was delightfully surprised and super excited to relive the delicious experience. So the question is, were they as good as the ones I had at Expo West? The answer is YES, YES, YES! To me, the filets taste like Long John Silver's fish filets. Tons of batter, a little greasy and very filling. I've had food like this in a Vegan restaurant, but never from the frozen food aisle at the grocery store. It's really game-changing (to me anyway) that you can have a frozen Vegan fish filet that is decadent and better that the real thing. I have a feeling that meat eaters (or fish eaters, whatever) will really take to what Gardein has done here. 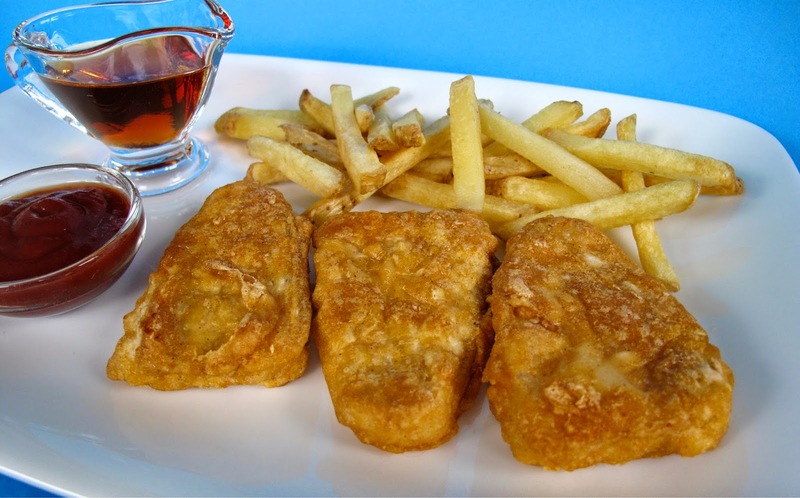 The filets are not revamped Crispy Tenders, they really look and taste like battered fish! The batter is divine, nice and crispy. The toaster oven or regular oven is recommended for cooking and I totally agree. Don't even mess with the microwave on this one. The inside is juicy and tangy, it will really take you back. How they got the texture and flavors down, I have no idea, but I'm happy they did! As you can see, I made up my little version of Vegan Long John Silver's. It's got balsamic vinegar, ketchup, fries and the filets. I died! It was soooo good. Now let's be honest, this isn't low fat food. It's greasy, but that's what makes it so wonderful. Sometimes I wanna' splurge and this is the perfect food to do so. Gardein has become the king of Veganizing food experiences from my non-Vegan past. Chicken Fingers? Check. Beef Cutlet? Check. Chicken Patties? Check. So far, this is my favorite new product of the year and I don't know what could possible top it, but I'd sure love to see someone try. I will have to try these. I know my local store carries them but the Long John Silvers comparison will push me to actually buy some. The post is in French though. DYING of jealousy over here. My Whole Foods doesn't have them yet. I'll keep stalking the freezer aisle until they come in. Gah! I cannot wait to try these, I used to love fish & chips and those fillets look perfect. Very cool. I'm excited about their potential impact. Why aren't these in my area? I will have to start requesting them. How do you think they compare to Sophie's? I finally found these today! I can't wait for dinner time! I have a vegan friend who never liked fish when she did eat animals and she can't bear to eat Gardein Fishless Filets because they taste *exactly* like fish. Except no gross blue veins or gray slime like when you eat a dead animal. I eat them with oven french fries (the accidentally vegan ones from Aldi's freezer section are nice) and some Veganaise mixed with pickle relish.